Dated & signed vo. print in pencil. Inscription: Titled vo. print in pencil. Edward Weston was fascinated with Mexico's stirring sky, which he found to be far more inspiring than Southern California's blue expanses. Writing in his daybook, he expressed his concern: "Clouds have been tempting me again. Next to the recording of a fugitive expression, or revealing the pathology of some human being, is there anything more elusive than cloud forms!" The sky changed so rapidly in Mexico that Weston bemoaned the difficulty of making a two-second exposure. 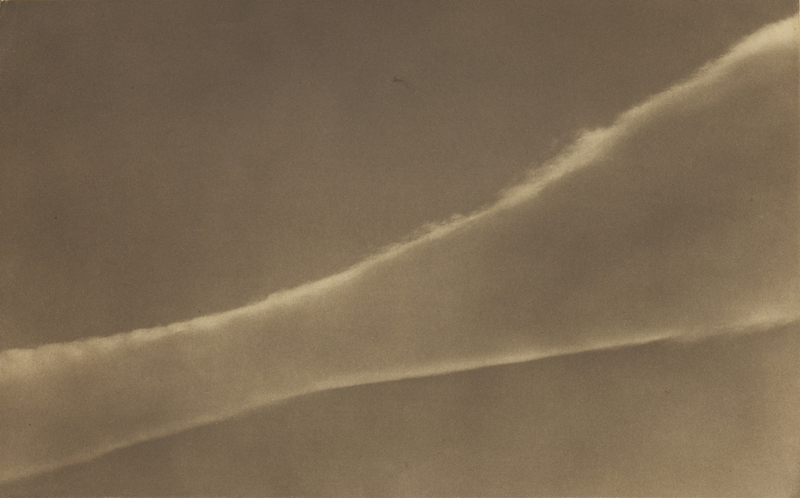 Throughout the three-year period that he spent in Mexico, from 1923 to 1926, Weston repeatedly photographed the restless clouds sweeping overhead. Daniel Wolf, Inc. (New York, New York), sold to the J. Paul Getty Museum, 1984. Conger, Amy. "Edward Weston's Early Photography, 1903-1926." Ph.D. diss. (University of New Mexico, 1982), 26/270.